This scenario is dual-statted for both Action! System and D20 Modern. Publisher's blurb: "The PCs must investigate the appearance of a new supply of drugs on the streets of their home city, during which they learn of the disappearance of a young boy and strange goings on in a suburban neighborhood. Are the events somehow connected? 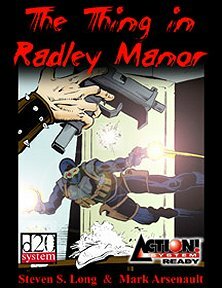 "Using their wits, skills and (hopefully) the cooperation of a group of children in the neighborhood, the PCs must track down the perpetrators and uncover the mystery of The Thing in Radley Manor!"